Roc Holiday Village to Return in December! Organizers Announce Extended 2019 Dates and Hours Plus a New Year’s Eve Celebration! Save the dates for the second annual City of Rochester Roc Holiday Village presented by Five Star Bank, which will return in 2019 with an expanded schedule of an additional day, added hours plus a special New Year’s Eve celebration on Tuesday, December 31. The second annual City of Rochester Roc Holiday Village presented by Five Star Bank will open Friday, December 6 and continue through Sunday, December 29 on Fridays, Saturdays, and Sundays. Hours will be extended for shopping in the Village, in The Lodge for food and drinks and for other free family activities and events. Stay tuned for specific hours, activities and events, and details on the Roc Holiday Village’s New Year’s Eve Celebration to be announced in the fall. 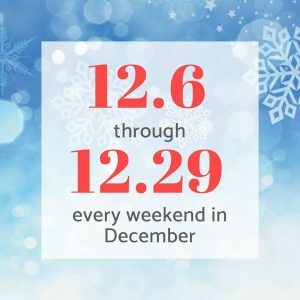 In the event’s first year, more than 120,000 people of all ages visited Roc Holiday Village in the heart of downtown Rochester at Dr. Martin Luther King Jr., Memorial Park for skating, shopping, live music, visits and Breakfast with Santa, crafts and more. Pop-up restaurants and the bar in The Lodge were a huge draw all 11 days last year. “Our inaugural year simply exceeded our expectations and we could not have been happier with the incredible response,” said Jenna Knauf, co-founder and producer of Roc Holiday Village along with Sean McCarthy and Kelli Marsh. Companies interested in becoming a sponsor or vendor may contact Jenna Knauf at Jenna@RocHolidayVillage.com.